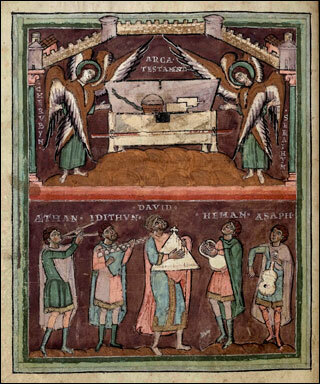 The psalter (foll. 19-228, 232-233) was written in the 2nd third of the 11th century from a hand that was possibly trained in an Alsatian scriptorium. The previous part with the calendar (foll. 1-18), apart from later additions, was written by a Lorsch scribe in about the 2nd quarter of the 11th century. Necrological additions in the calendar indicate that the manuscript was once held at the Lorsch branch monastery Saint Michael on the Heiligenberg close to Heidelberg. 36r-37r "Origo prophetiae David regis psalmorum numero CL"
39r/v "Laus psalmorum sancti Augustini"